My brother-in-law-stroke-builder-stroke-temporary-lodger was telling me about his rough, dry elbows. Now don’t get me wrong, he wasn’t whining about them or lamenting the absence of smooth, soft baby-skin – he’s not that type of chap. In fact, if Eric (for that is his name) ever uttered any kind of beauty-related sentence, I would quite literally fall to the ground and die of heart failure. This is a man who will smoke a fag, hands-free, whilst ripping down plasterboard with a claw-hammer and holding his tea steady at the same time. He eats nuts and bolts for dinner and he bathes in Swarfega. So please don’t think that this conversation took place due to his vanity or any kind of concern for his well-being. He would hate to come across as soft. So yeah, we were chatting about his elbows and also how he plucks his brows (JOKE!) and he was saying that plumbers and builders get really cracked, dirty elbows and nothing can cure them. I gave him a Palmer’s Swivel Stick to try and within one day he had come back showing spectacular results. “Feel my elbows” he ordered. And I did. They were pretty soft. And clean! 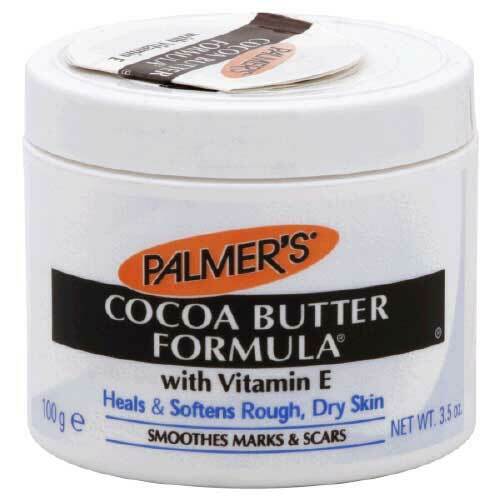 The Cocoa Butter had formed a protective layer during the day that dirt couldn’t penetrate and so his elbows stayed clean, but the Cocoa Butter also softened the skin! Marvellous – if it can cure Builder’s Elbow then I can only imagine what else it could be good for! Brickies’ hands? Mechanics’ arses? Personally, I have been putting the original formula ‘in a tub’ to the test – slightly more messy and less convenient than the swivel stick, but highly effective nonetheless. It always astounds me how something that feels so oily upon application can absorb so well. Palmer’s is one of those products that has lasted so long for a reason – it does what it says it will do, and it doesn’t charge the earth for it. 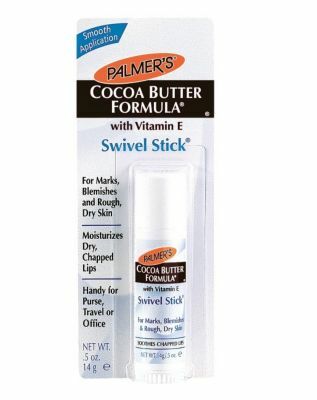 Unfortunate if you hate the smell of Cocoa Butter, but if you’re on a budget and you need to soften up hideously dried-out skin, it’s an excellent cheap option.